ORIGINAL MOVIE POSTERS & LOBBY CARDS. Welcome to Déja Vu Gallery! We accept all reasonable offers! This is the original advance poster printed for the promotion of. Ghostbusters This poster was not distributed to the general public, and was only intended to be displayed in theaters. This classic movie poster will look incredible on your wall! This poster has been professionally stored for decades. This poster was issued Folded. We grade our items using the standard A - D scale. We do not sell items that are in C or worse condition. The item has been lightly used. May have the slightest of wear. The item has minor history of use. Some wear and tear, but still very presentable. The item has moderate history of use. Fair (B-) This item has seen considerable use. We use durable high quality packaging materials. Most items are vintage and have minor history of use, so please keep that in mind. We try to photograph and describe each item as accurately as possible. Please examine the photographs and read the descriptions carefully. Your satisfaction is important to us. Please inspect the item(s) upon receipt and take photographic evidence of the item's condition if there are any discrepancies from the item(s) description. Because of the varied sources, we do our best to determine authenticity. For autographs we issue a certificate of authenticity which we stand behind. Déja Vu Gallery Collection for Sale! Déjà vu Gallery is a company specializing in the fields of fantasy and adventure literature, classic movie poster & lobby cards, autographed celebrity photos, and specialty magazines. A large collection of Hardback and Paperback books, and more! 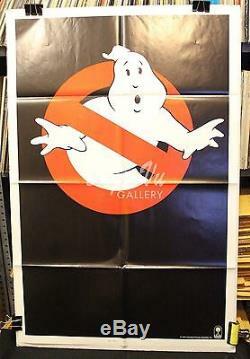 The item "Ghostbusters Original Advance Movie Poster 27 x 41 1984 VF" is in sale since Tuesday, July 26, 2016. This item is in the category "Entertainment Memorabilia\Movie Memorabilia\Posters\Originals-United States\1980-89". The seller is "dejavugallery-6137" and is located in Los Angeles, California. This item can be shipped to United States, Canada, United Kingdom, Denmark, Romania, Slovakia, Bulgaria, Czech republic, Finland, Hungary, Latvia, Lithuania, Malta, Estonia, Australia, Greece, Portugal, Cyprus, Slovenia, Japan, China, Sweden, South Korea, Indonesia, Taiwan, South africa, Thailand, Belgium, France, Hong Kong, Ireland, Netherlands, Poland, Spain, Italy, Germany, Austria, Bahamas, Israel, Mexico, New Zealand, Philippines, Singapore, Switzerland, Norway, Saudi arabia, United arab emirates, Qatar, Kuwait, Bahrain, Croatia, Malaysia, Brazil, Chile, Colombia, Costa rica, Dominican republic, Panama, Trinidad and tobago, Guatemala, El salvador, Honduras, Jamaica, Viet nam, Uruguay, Bolivia, Sri lanka, Luxembourg, Peru.